I have a different outlook on engineering now because of this trip. When Nicolette Corrao heard about ENCE489G, she was excited at the chance to go abroad over spring break. 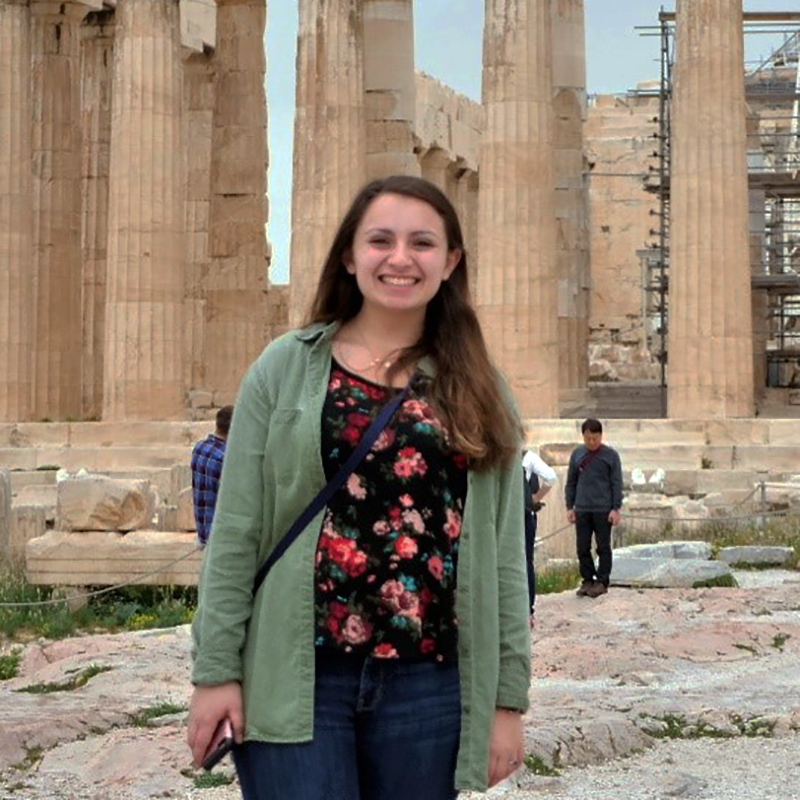 She knew a full semester abroad would be difficult to fit into her four-year plan, so a short-term study abroad experience was an ideal opportunity. She was especially interested because the course could count as a technical elective for the CEE major. In the course, the students worked to redesign a square in Athens using green infrastructure and solar energy. Doing so meant gathering and incorporating information about Greek culture. Nicolette says this taught her a lot about “the thought processes behind sustainable design,” as she puts it, as well as “stakeholder analysis—who is affected by what you’re doing.” “I will be going into my upper-level classes with a lot more knowledge about design, stakeholder analysis and sustainability practices… I have a different outlook on engineering now because of this trip,” she says. Nicolette also enjoyed the guest lectures by professional engineers, particularly one about road safety analysis in which she learned about the Greek system of rating road safety. She found a site tour of a construction site for an important metro stop interesting as well. 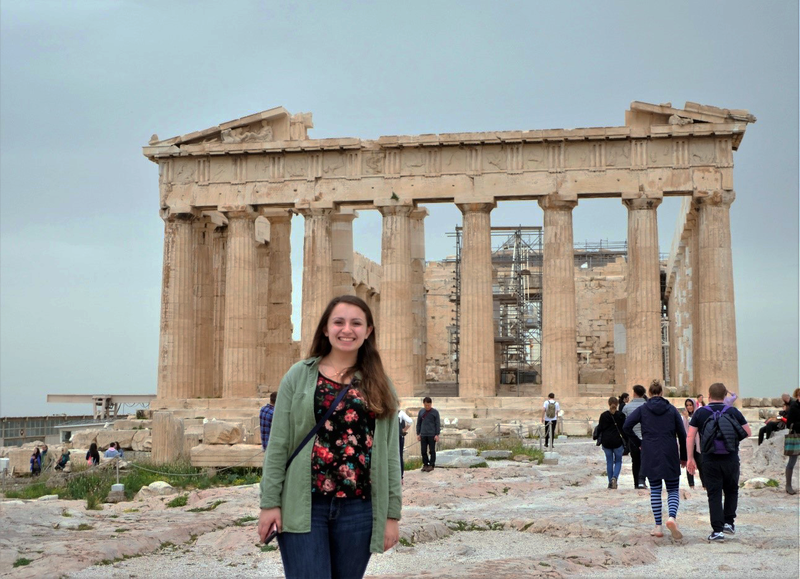 Seeing the Parthenon, which she says was “amazing,” was another highlight. Nicolette’s favorite part of the trip was the three-island cruise the class took on the last day. “The islands are so much different than the city,” she says, adding that she and Dr. Natasha Andrade noticed more sustainable infrastructure on the islands than in Athens. On one island, they even saw someone who was heating their water on their roof. Nicolette also particularly enjoyed one evening when the class ate traditional Greek food and danced to Greek music. Nicolette says she would encourage anyone with the ability to study abroad to “definitely consider it.” In particular, if a student doesn’t have room in his or her schedule for a full semester abroad, or if he or she is considering a summer course anyway, a short-term course abroad is a great idea, she says. As she points out, students in such courses get the credit for the course and get to experience another culture as well, so it’s a double benefit. She also says taking ENCE489G abroad was less expensive for her than taking a regular summer course would have been. After graduation, she hopes to go abroad again to travel around Europe, including returning to Greece to see the other islands.